An expert on prescribed fire will give a talk on the "History of Fire in the Southern Landscape" at the Sewee Fire Fest in Charleston County on Saturday, March 12. 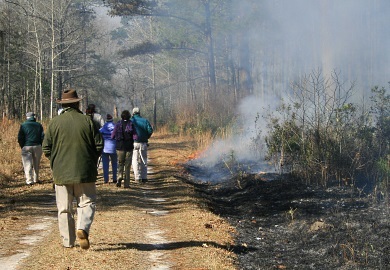 Johnny Stowe, wildlife biologist, forester and Heritage Preserve manager with the S.C. Department of Natural Resources (DNR), will speak on the natural and cultural heritage of prescribed fire in the South during the Sewee Fire Fest at the Sewee Visitor and Environmental Education Center, 5821 Hwy. 17 North, in Awendaw. The Sewee Fire Fest runs until 2 p.m. Stowe's talk is set for 10 a.m.
"It's important for all of us to understand the role fire plays in forest health," said Colette DeGarady, assistant director of science and stewardship for The Nature Conservancy. "We were thrilled by the success of last year's event and the chance to promote fire in the Lowcountry again this year." The second annual Sewee Fire Fest will include an exciting live burn at 1 p.m., weather permitting. Also featured will be a birds of prey showcase, a bounce house, balloon artist, face painting, sweetgrass basket making and sales, food vendors and the chance to meet Smokey Bear and Woodsy the Owl. Attendees can also learn about local organizations working to restore forests and protect communities through prescribed fire. The event is free and open to the public. It is being held by members of the Sewee Longleaf Conservation Cooperative and organized by the Center for Heirs' Property Preservation and The Nature Conservancy. For more information on Sewee Fire Fest, contact DeGarady cdegarady@tnc.org or (843) 937-8807, Extension 15.